Dropdown login forms are not a feature many online stores use, but in some cases they could be quite useful UX feature. In this tutorial, I will explain how to create such a dropdown in a few minutes! Let’s open app/design/frontend/base/default/layout/customer.xml and just add the line that’s highlighted. And, lastly, open app/design/frontend/base/default/template/customer/form/mini.login.phtml as well and place the code below instead. The important thing to note here is that we’re using Magento’s default mini.login.phtml with slight modifications for it to work on homepage. We’re also using core/template block instead of customer/form_login. The reason for this is that the latter sets the page title to ‘Customer login‘ on all pages it’s being displayed on. As a downside to using different block, we now can’t use methods of the customer/form_login block. That is why we’re using $this->getUrl(‘customer/account/loginPost’) as a form action instead of $this->getPostActionUrl(). It’s also important that you have a form key present, otherwise your form won’t get processed. Hi, It did not work well when i followed your instructions what you told. Please kindly help me out. I want to add login signup and login/out options inside account i.e account as dropdown menu where login , sign up and login/logout should be inside Account dropdown. Can please somebody guide me how to do this.. I tried but is default . .. Please help.. such that it should not effect the functionality . . . ..
One way would be to compare the title of your links before they get printed to html with the title of your ‘Log in’ link, e.g. Place the condition inside the ‘else’ (lines 8-13), depending on the construction of your links. Btw, what if my login form is not in the last li? And not in the first li? How can I make the dropdown drop? Sorry, everyone. I seem to have forgotten one more step that needs to be done in order for login box to show. The article has been updated, just edit the links.phtml template as shown above. I really liked this Petar. It looks simple but a valuable feature. 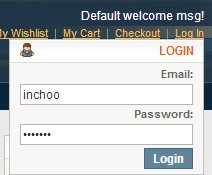 We recently had this requirement for a B2B Magento website and a drop down login is a valuable UX feature. I agree that the block type of core/template can be limiting sometimes – you should always try to adopt your template to an existing block the template is based on, or create a brand new block.